Several interventions remain almost inaccessible to endoscopic surgery, such as brachial plexus injuries. 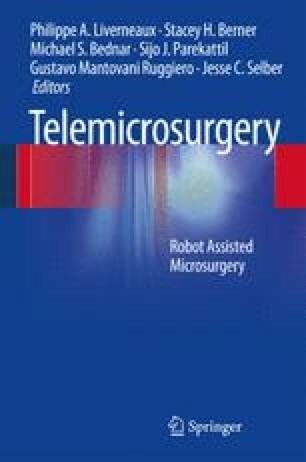 Development of minimally invasive and robot-assisted surgical approaches has the potential to greatly improve the surgical outcome. Our clinical experience is based on 12 cases of brachial plexus tele-endomicrosurgery operated using a da Vinci robot. Considering the microsurgical gesture, all nerve repairs were achieved under excellent conditions. Considering the minimally invasive approach, results are yet inconclusive, with a need to convert to open surgery in 9 cases. The reasons for conversion were numerous: difficulties to maintain the resection cavity, unsuited instrumentation, blurring of the stereoscopic vision and major difficulties in visual identification of anatomical landmarks. In brachial plexus surgery, tele-endomicrosurgery is feasible but faces major constraints regarding the creation, maintenance and navigation inside the working chamber. Adaptation of the endoscopic equipment and use of advanced techniques of augmented reality should address most of these problems.